The occupation was an inspiration for many - the spirit of the workers who refused to submit to being blatantly robbed by their bosses seemed to be what many had been waiting for, for far too long - the early possible signs of a resurgence of class struggle. Now that the occupation is ended without any clear victory in sight, some reflection is needed on the strengths and weaknesses of what has happened. It is always easy to be wise after the event, and necessary to be careful not to forget who initiated this struggle and took the risks. Any criticisms are as much of ourselves as supporters as of the occupiers. Still, we'll never get very far in developing our struggles if we don't reflect on where we went wrong and how we all might do things better next time. The union pursuaded the workers to end the occupation today (Thursday Apr 9th) without any details of the rumoured deal being made known to them. They are told all will be revealed on Tuesday. The obvious question is - why then not wait until Tuesday to decide whether to leave the factory? There will be different answers from different interested parties. Some workers may say they are tired from constant occupation and/or that they have been pursuaded/pressured by the union that the bosses have insisted the occupation must end to guarantee the unspecified possible deal. The union may also claim that there could be legal penalties for failing to comply with the undertaking given in court on Monday to leave the factory by noon today. But none of this appears very convincing or in the workers' interest; they have surrendered their greatest bargaining asset, the possession of the plant, its machinery and stock. So the negotiations restart on Tuesday from a weakened position for the workers. The picketing that is planned to replace the occupation will be less effective in preventing repossession of Visteon property. And legal threats can probably be applied to enforce restrictions on picketing activity too. The rough conditions in the factory shouldn't be underestimated, but another few days might have made all the difference to the outcome that may determine the workers' long-term financial future. (The Ford pension fund is already 100s of millions in the red.) It had already been suggested that a rota system could've been set up, with help from supporters, to ease the strain of manning the occupation. The union may claim that the undertaking they gave in court on Monday - that the occupation would end by noon today - left them open to legal penalties; but even the judge queried if they could guarantee the obedience of the occupiers. One would think that all the union would've needed to do to protect themselves is to say that they had made an effort to pursuade the occupiers to leave. The occupiers themselves could have stayed with no legal sanctions hanging over them other than a standard possession order common in squatting cases. The agreed undertaking with Visteon was that they would not seek possession while negotiations continue. Visteon - and the union - made that conveniently obsolete by agreeing to postpone revealing any details of the deal until Tuesday (if there even is any deal). One can speculate that if a really satisfactory deal was on offer the union would already be shouting it from the rooftops. In the final meeting of occupiers no real opposition was expressed to the union's direction to walk out. This despite some occupiers in earlier conversation expressing a desire to carry on until a decent deal is struck. The same union convenors, who in the beginning had said they and the other occupiers would never leave until a satisfactory deal was agreed, were now obliged to convince the workers they must leave with nothing guaranteed, only rumours of a possible mysterious deal to come. Some in the meeting voiced serious criticisms of the union for keeping them in the dark about developments and not giving enough support to the occupation, but most were by now either relieved or resigned to walking out. The union's authority to ultimately decide the fate of the workers was not challenged. Early on in the occupation, when it was mentioned that the union might pressure an end to the occupation against workers' wishes, a couple of workers replied "ah, but we are the union", as if the workers' collective voice could control the union structure. But once negotiations were organised by officials - on the other side of the world - and the whole process becomes remote and secret from the workers in the hands of specialists, they become dependent not on what they know, but on what they're told. And we know from long experience that the union hierarchy has its own vested interests to protect that often don't coincide with that of the workers. As the occupiers came out, the SWP - never ones to miss an opportunist photo-opportunity - swamped the crowd with their placards and chanted 'the workers united will never be defeated'. Under the circumstances, this had a hollow and ironic ring. It began to feel, as nearly every strike has in the past 20+ years - like one more predictable stitch up by union bureaucrats - more interested in helping Nu Labour manage capitalism in crisis than feeling the need to win even modest gains for workers. 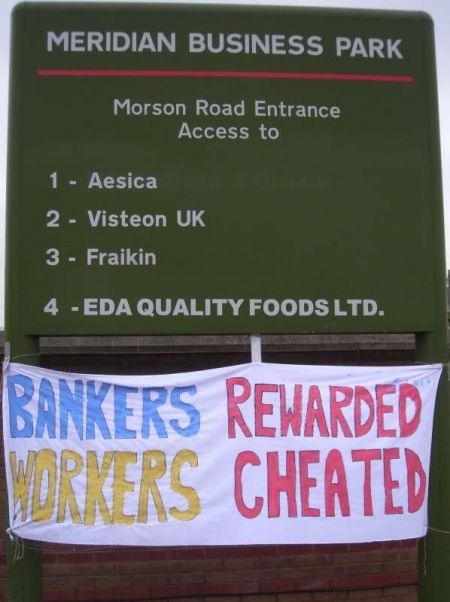 Even if a passable deal is struck next week, one could see the ending of the occupation as unnecessarily risky and bad strategy for the workers and an unsatisfactory capitulation to pressure from both Visteon and union bosses. But it is often awkward to stick one's neck out; given the general identification with the union, many supporters felt sensitive about being openly critical of the union and its underlying agenda, for fear of being seen to be divisive. But at the end of the day it's no good repressing these criticisms - or glossing them over for the sake of some image of unity - when only the explicit recognition of these realities may prevent defeat. It was a real contrast to see how much energy and resources went into the organising of the G20 protests compared to how much support the Visteon occupation was given. This is partly an indication of the difference in priority, for some, given to activist protest on the one hand and class struggle on the other - and partly that many useful G20 resources had already returned to their sources outside London. It is only now that the union - as the occupation ends - provided a caravan, brazier, toilets etc. Documents uncovered by Visteon workers at Basildon suggest that closures have been planned for several years with the intention of restarting production with cheaper labour - and that the creation of spin off companies like Visteon is part of a long-term strategy to restructure and trim away the less profitable parts of the car industry. So the lessons and outcome here are important for whoever is next in line for the chop. 24hr picketing will continue, and a Ford/Visteon Supporters Group has been set up. Agreed. I guess we have to answer the question why workers did not dare to stay inside despite the union advice. there is the personal-moral element: the state threatened Kevin, our rep and work-mate, and the union got him out by agreeing that we would leave (if that is actually true is a different question). There is the 'organic union corruption' element: we managed to get good lawyers and we flew your mechanic to a meeting with the big-wigs to the big apple - now how can you not collaborate with us by following our advice?! The legal question is such a complex and threatening thing, it seems to need specialists to understand it, either in form of well-paid lawyers or in form of semi-professional squatter advisors. The main support by the 'anarchist' left was 'specialised', e.g. in form of computer technical support, or media contacts or legal advise. may be a focus on 'how to make decisions in bigger groups, how to spread information more equally" would have been more fruitful than getting bogged down with all the legal stuff. It was so obvious how the relation of the occupiers with their occupation changed during the week. at the beginning even Kevin would refer the invited journalist to the security guards at the main gate in order to ask for permission to enter the factory. The next day, after some back and forth with the security guards the workers just pushed open the gates, and a dozen of scruffy anarchist could enter the plant. The union's decision to declare that the 'unknown legal person' in court are 'unite members' changed the atmosphere: outsiders had to leave the plant, in the end there was only X allowed to stay inside (because he has been inside right from the first minute), but during the meeting with the union official Wednesday night even he had to stay outside. On top of the legal attack there is the state in form of the job centre starting to individualise people. all workers get individual letters, during the last days they had to appear at the job centre, filling out their first ever dole claim, they have to sort out their mortgages. no attempt to undermine this form of decomposition as 'unemployed'. Most pressing unanswered question relate to the material power: what about southampton not having enough parts to continue production? what about the rumors that visteon want to open a shadow company and keep production in the UK, may be even inside the plant in enfield? What about the plan to shift some of the machines to Berlin? What is the situation at the Visteon Enfield suppliers, one of them 3M, the company where workers in France boss-napped the management only some weeks ago? What is actually behind the rather empty promise of the Ford workers reps to black Visteon parts - what are Ford workers willing to do? Without being able to answer these questions it will be difficult to give workers 'better advice'. In france there was an attempt to transform some of the factories in struggle against closures into something like nods for wider discontent against job cuts, e.g. by holding a struggle conference of workers affected by job cuts in one of the plants. If, for example, some city cleaners and sacked call centre workers would have started to link their situation with the one in Enfield, it could have bridged the (geographical) gap to the 'London' class situation. Yep, I was hoping they would stay in, for the reasons you have outlined above. Hope it now doesn't just into the usual pattern of defeat I've seen for the past 25 years (all my bloody active adult life). A strategy of continued defiance and extended occupation could not have easily been pushed for by supporters from 'outside' the workforce. Rather it would obviously have required at least a minority of the occupying workers themselves to have argued and campaigned for staying in - which would have meant a battle of ideas and influence with the official full time union machine. It would mean a preparedness to defy both the courts and the union machine. Obviously the workers here have shown great militancy and political awareness. I wondered if those eight days would generate the organised and politicised 'rank and file' alternative necessary to overcome the TU bureaucracy. It obviously did on one level - to occupy in the first place! Such a stand would have been stifled at birth by the full time bureaucracy, had they had the chance. The idea of occupations might grow. Its interesting to speculate: Waterford Crystal workers occupation in the Irish Republic was the first example. Did this receive more publicity in the Six Counties than it did in the rest of the UK? Did that influence the Belfast Visteon workers to choose occupation? Visteon then become the channel for the example spread to southern England. There are also the school occupations against closures by parents, teachers and kids in Glasgow. Has the seen been planted? Can we spread the example? Solidarity work - taking collections and leafleting other workplaces (preferably with Visteon workers alongside you) is crucial for two reasons. 1) to raise actual solidarity - financial and other for the Visteon workers - 2) to spread the idea of occupations against closures and job cuts. Vauxhall's Ellesmere Port plant seems obvious - the sword is hanging over it as GM goes into meltdown. LDV at Birmingham is another. Collections, leafleting and visits by Visteon workers to these plants could spread the idea. Getting to know workers in these places would help also. Its also worth noting that Unite have called a national demonstration for Saturday, May 16th in Birmingham city centre against job cuts in manufacturing.